This single was officially called "Single-Bilingual" for all but its Italian release. All editions contain versions of the song "Discoteca", sometimes to the exclusion of any other tracks. Although I'm not a big fan of the album "Bilingual" as I've already wrote before, I love the track "Discoteca" which would have made more sense as a single than err the actual single "Single-Bilingual". "Discoteca" is with "Up Against It" the only 2 tracks I actually like on that album. But the album version of "Discoteca" is much better than all the remixes and single remixes tried by the PSB and their remixers. The album version is the best. Its only problem is that it's just a little bit too long. A little bit shortened and not segued into "Single" of course, it would have made a terrific song for single release. Chris Lowe himself admited in the booklet of the double-pack CD release "Further Listening" of the album "Bilingual" that PSB probably chose the wrong singles. Yeah, you've got that right, mister. That's exactly what I think too. Only 300 of this vinyl records were pressed. 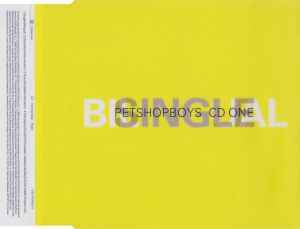 The Pet Shop Boys' own extension of "Discoteca" actually makes better sense than the shortened version, adding a nice string intro and giving a real disco feel to those drums and the (almost random) Spanish chanting. "Confidential" sounds like a throwback to their showtune days -- in other words, it's classic Pet Shop Boys. I only wonder how it would sound with Tuna Turner. Baby Doc's mixes of "Single-Bilingual" and "Discoteca" go for a harder, more progressive dancefloor sound. Nice. Hmm, SINGLE-BILINGUAL (as a stand-alone track) isn't the most scintillating that the Pet Shop Boys have done. "Discoteca" is more interesting, putting the Spanish-lite vocals and Spanish-tinged rhythms to better use. Still, the track doesn't quite come all together. "The Calm Before the Storm" is more typical and put-together: gentle vocals, pretty arrangements. Interestingly, the Trouser Enthusiasts' take on "Discoteca" actually puts the disco back into the track, improving it.